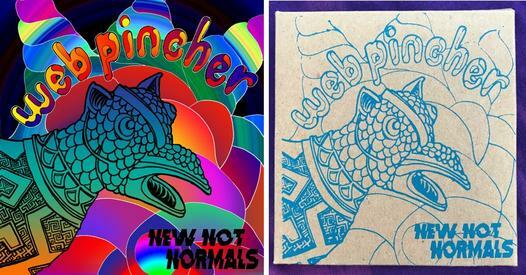 The latest full length album from New Not Normals, Web Pincher, is a treasure of inspired rock tunes. The three piece band, consisting of Joshua Boyd on guitar and vocals, Cyndy Chan on bass and vocals, and Dan Kompton on drums (though previous drummers* played on the recordings), is a subset of Trick Sensei, a larger five piece band with multiple songwriters that has been playing around town for many years. Cyndy and Josh kicked off New Not Normals a few years back, as a smaller act with the flexibility to play more often and focus on Josh’s tunes. The first track on Web Pincher, Valkyrie Rainbow, kicks off the nine track album with the quirky intro from the Laverne and Shirley 1980s sitcom. “Schlemiel! Schlimazel! Hasenpfeffer Incorporated! We’re Gonna Do It!” is then followed by an unapologetic three minute long rock jam that is loud and inspired and catchy as hell. It’s a testament to how comfortable they are in their own skin. The second track features Josh’s otherworldly theramin playing and Cyndy literally singing out the letters of the song title, S-O-R-C-E-R-O-R-S-A-U-R-U-S, to the beat of the song, showcasing Cyndy’s little known background as a former spelling bee champion. Is this this singing or spelling? Well it’s both. Trying to spell-sing along is guaranteed to trigger a smile. 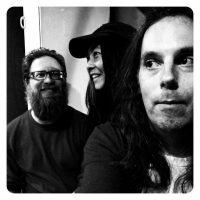 Another standout track, Walking on My Grave, is their cover of a song by one of Portland’s iconic punk bands, Dead Moon, and is an example of how New Not Normals pays respect to Portland’s music culture, past and present. The album is a cohesive collection of 9 tracks playing off of riffs and jams with each tune taking a different twist. Cyndy and Josh are a backbone of Portland’s music culture. They take pride in the creative lineups they frequently stitch together, often giving up-and-coming bands a chance to be heard. They are a kind of glue that holds together a somewhat fragmented cliquish scene- a positive force who are always finding ways to be more inclusive and connected. Cyndy has even been known to host Sunday brunches for the rock’n’roll women in town, sans instruments, that include casseroles made from the eggs of her backyard chickens and clothing exchanges to energize rock’n’roll wardrobes. They are also DIY masters. At their recent CD release party at the World Famous Kenton Club they had limited-edition merch on hand, ranging from CDs in hand silk-screened packaging, homemade cassette tapes, and a handful of tie dye tshirts with a must-have psychedelic cat motif that nearly sold out within a couple hours. Some of New Not Normals’ charm comes from their humility. While other bands seems to be reaching for the stars, New Not Normals seems quite content with playing locally and growing their fan base at a more relaxed pace. In fact, they seem honestly surprised at their growing popularity. In the spirit of full disclosure, I play in one of Cyndy’s three bands, Avalanche Lily, but neither Cyndy nor her bandmates have ever asked me to write up a review. You can check out their tunes on Bandcamp, Spotify, or whereever you listen to music, and follow them on Facebook. Their next show is an all ages gig and it’s coming up this Friday on May 25 at the American Legion Post 134. As a PUFL Member of Oregon’s American Legion Post 134; the New Not Normals performance was truly outstandingly & perfect. Not Loud Noise, but Real Music well done!